PIKETON, Ohio – Thousands of children had a happier Christmas this year, thanks to the Christmas Gifts for Children Program at Portsmouth. 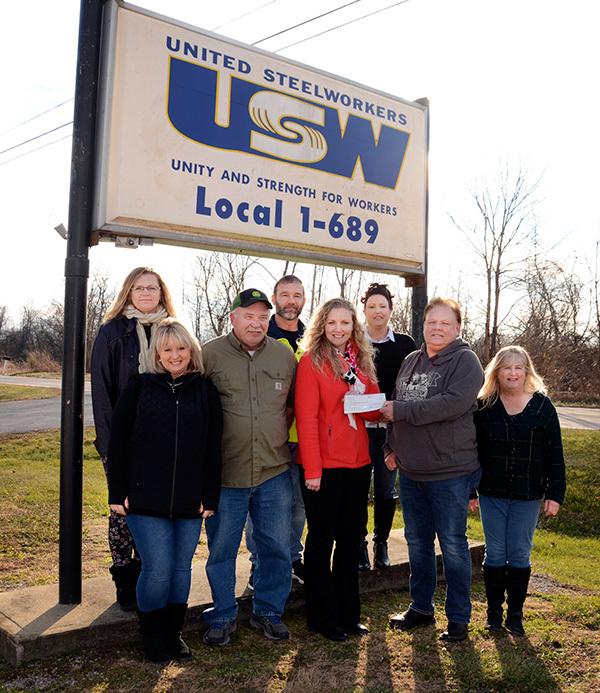 On Dec. 14, the United Steelworkers’ Women of Steel provided a $1,406.05 check to the Christmas Gifts for Children Program. This donation allowed for the purchase of gifts for up to 45 needy children from our local communities. Nearly 3,000 children received gifts through the program in 2017, with some being added to the list at the last minute. “We were receiving calls from frantic parents less than a week before Christmas hoping to find anyone who could help them provide a gift or two for their children. They were so relieved when we told them that we could help. Thanks to the generous donation from groups like the Women of Steel, all of the children received wonderful sets of gifts that were delivered in time for Christmas,” Gary Crandall, president of the Christmas Gifts for Children Program said. During the previous month, members of the Women of Steel collected donations from employees of the former Portsmouth Gaseous Diffusion Plant during a “bucket drive” held at the site. “Without the generous giving of everyone at the plant, this would not be possible. This helps us give back to the community we live in and lets them know that we care,” Francie Mullins said. Nearly 2,000 workers are employed at the Department of Energy’s (DOE) site in Piketon, and approximately 800 employees are members of the USW. The USW Women of Steel is an arm of the United Steelworkers union, the largest industrial union in the United States. For more information, visit http://www.usw.org.